Click on your early learning service's 'Community' tab. 1. Find the community post you wish to delete. 2. Click the grey arrow in the top right corner of the post. 3. In the drop-down menu select ‘Delete post’. 4. A pop-up box will ask you if you're sure. Click 'OK' and the post will be gone; no-one will be able to access it again. Find the community post you wish to edit. Click the grey arrow in the top right corner of the post. In the drop-down menu select ‘Edit post’. 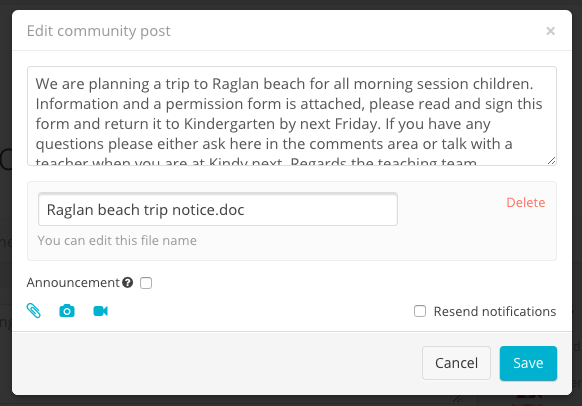 A pop up will open where you are able to edit the text and media or attachments in the post.